The Minimoog from Moog Music, the world-famous synthesizer introduced in 1970, was a revolutionary instrument to that of the modular systems. Its portability that allowed musicians to bring around to live performances resulted in a huge hit with 12,000 units sold. Modular systems are operated by patching each modules of the synthesizer to freely create sounds. The Minimoog pre-patched these inside the system and effectively designed and layouted the 3 major components to a synthesizer: the oscillator (VCO), the filter (VCF), and the amplifier (VCA), for maximum ease of use. Its innovative development defined the synthesizers of today. 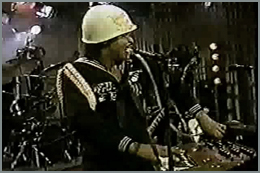 Roger Troutman performed on the Minimoog during the 70s and the 80s. The Minimoog is clearly ideal for fat high/sharp low “Roger” sounds. 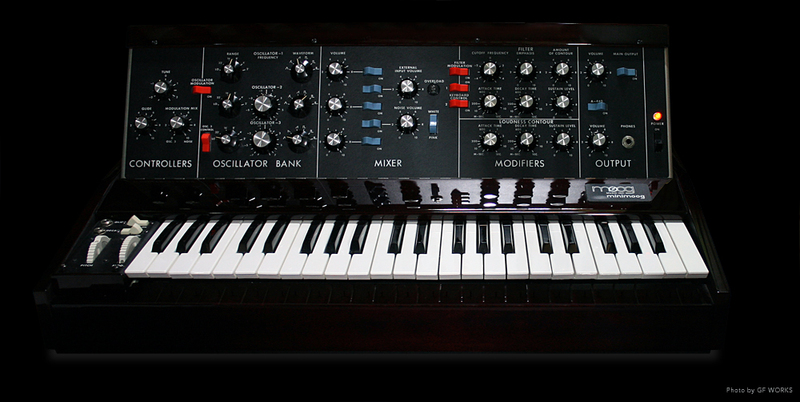 The Minimoog is also used in many of his famous recordings. If you observe his performances on the Minimoog, you can tell that he rarely uses the pitch bend wheel. I would guess this could be due to the large range of the pitch bend and its characteristic that doesn’t swing back to its stand-by position automatically. He instead uses the frequency knob on Oscillator 2 to alter the pitch. Since oscillator 1 does not have a frequency knob, you could tell that he does not use Oscillator 1. Oscillator 3 is used for modulation, so you can tell that he uses only 1 oscillator (Oscillator 2) for his performances. Analog synthesizers uses the method of subtractive synthesis, where the 3 main functions include the oscillator that creates the fundamental sound (VCO), filter that filters the harmonics (VCF), and the amplifier that adjusts the volume (VCA). These are also the relative steps to be taken to create sounds on the synthesizer. Commonly, waveforms can be selected from sawtooth, triangle, square, and pulse waves. For talkboxes, sawtooth and pulse waveforms are commonly used. Sawtooth waves include all even harmonics and pulse waves consist of only odd harmonics, and both waveforms are suited for synth bass and lead sounds. Pulse waves with bandwidth of 50% are called square waves. You could also sharpen the sound by altering the bandwidth between 10% ~ 40%. Other waveforms include sine waves and triangle waves, but sine waves do not produce harmonics and triangle waves produce very little, resulting in both a clear sounding tone. These waveforms may therefore be unsuitable for talkboxes. Filters are just like a coffee filter, where unnecessary substances (coffee beans) are filtered to keep the necessary substances (the coffee). Filters for synthesizers filters harmonics of the sound generated by the oscillator (sawtooth, triangle, square or pulse) to create your own sound. Filters include “cutoff” which assigns the cutoff frequency of the harmonics, and “resonance/emphasis” which emphasizes the frequencies at the cutoff frequency. Types of filters vary depending on the synthesizer, but some are low-pass filter, high-pass filter, band-path filter, notch filter, etc. Low-pass filter: Filters frequencies above the cutoff frequency (passes the low frequencies); low low-pass filter cutsoff the high frequencies and results in a warm soft sound. High-pass filter: Filters frequencies below the cutoff frequency (passes the high frequencies); high high-pass filter cutsoff the low frequencies and results in a clear hard sound. Band-pass filter: Filters all frequencies except frequencies around the cutoff frequency (passes the frequencies around the cutoff frequency); Notch filter works the exact opposite of band-pass filter. Low-pass filters are normally addressed as filters for analog synthesizers. For talkboxes, cutoff should be at zero, but if you feel the sound is too bright, you might want to try closing it a bit. Attack time defines the time taken for the sound to reach full volume after the key is pressed. Decay time defines the time taken for the sound to fall from the full volume to the sustain level. Sustain level defines the level where the sound should be held while the key is pressed. Finally, release time defines the time taken to fall from the sustain level to 0 after the key is released. For talkboxes, attack time is usually pretty fast at around 300ms, decay time is 0 ms, sustain level at maximum, and a fair amount of release time, resulting in a trapezoid-like shaped envelope. Decay time isn’t used, so ASR should normally do the job.